2002 Boxster S for sale with 65,000 miles. Arctic Silver with Black Top and Partial Grey Leather. When purchase in Spring 2016, the following work was completed. •	Springs, struts and sway bars were replaced with a factory M030 suspension from Suncoast Porsche in Florida. •	I have changed out the grey console leather to black, as I prefer the console being all one color. •	The car is beautiful and I would rate the exterior and interior as 8 out of 10. No dents, but a few rock chips and scratches. It appears the front bumper was repainted before I bought it, and the clear coat is starting to chip. •	The car comes with two sets of 18-inch Porsche factory wheels. Currently on the car are the sport design wheels painted flat black with Continental Extreme Contact tires with 8/32 tread remaining. The black rims look good from 5 feet, but are on average 7 out of 10. I also have silver turbo twist wheels with Goodyear Eagles mounted with 10/32 tread remaining. The silver rims are in much better shape with three being close to perfect and one with some clear coat issues. •	I kept the factory suspension pieces (springs, struts and sway bars) that were replaced in the spring, and come with the car. •	I have a used unpainted carbon fiber hood, that comes with the car. 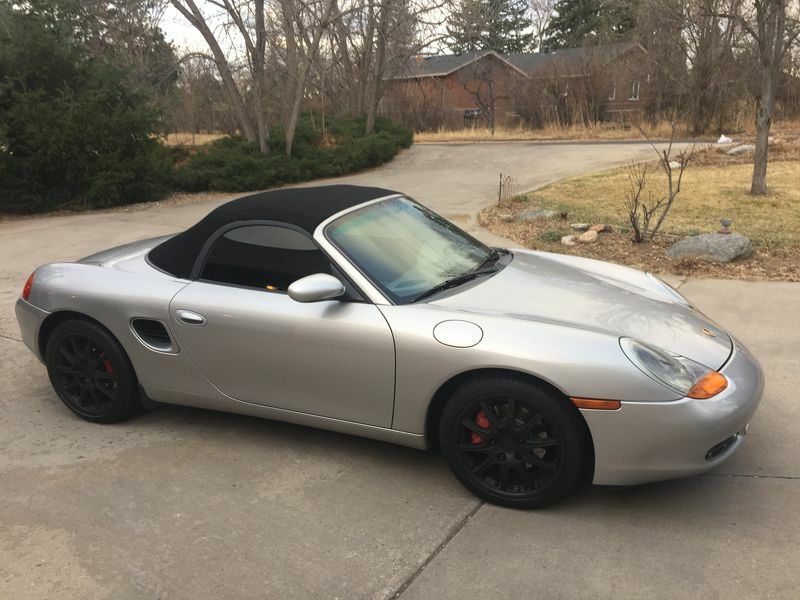 •	I love this car and have really enjoyed making it better, but have decided to upgrade to a Cayman S.
•	Priced at $19,000, please PM me with any questions. Car is a 2000, not a 2002. Come on, help a brother buy a new platform! Final price reduction to $16,000!